At Ecard Shack we always aim the highest, with our holiday ecards for business for exceptional service, quality and variety of our extensive range of designs. Not all customers want the same type of card, so because of this we offer a fantastic range of humorous e cards too. This hilarious image of the melting snowman is sure to amuse your clients this year! This funny snowman certainly has a character all of his own! From his big stone black eyes and carrot nose, he almost give you a little smile from his park bench. 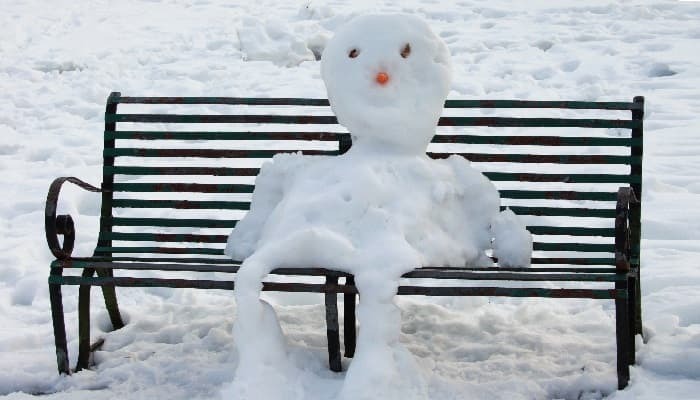 You get the feeling this snowman has a magic all of his own and has practically picked himself up and walked over to the bench for a rest! The background of the image, surrounding the bench is full of white thick snow and you can almost imagine what it was like as a child, playing in the blanket of snow with your family and friends. Every customer is bound to reminisce of making large snowballs to throw at loved ones (or not so loved ones!) and building snowmen like this. Please feel free to go to our website and see how this card can take shape and become your own. All you need is a witty caption and your customers are sure to be laughing this Christmas holiday season with our electronic Christmas cards for business.